Stay competitive. Help keep your company's bottomline to realistic cost controls. Time is money. For project managers, program managers, portfolio managers, business development managers. Date & Time: See the arrow down menu above for all selections. Earned Value Management Training Class Description: The most talked about topic among program managers, portfolio directors and business directors for measuring performance of a project is Earned Value. Yet it is most misunderstood by them. 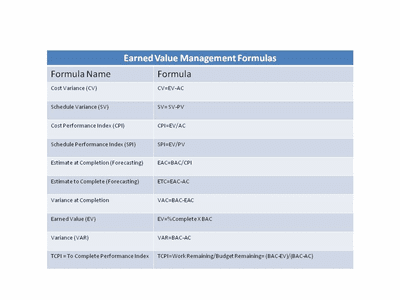 Earned Value Management is the process of measuring the cost & schedule performance of a project work against the project plan to identify variances. It can also be useful in predicting future variances in cost and schedule of a project. It is used for determining the final costs at completion of a project. Students should be familiar with project management terminologies and have some experience with project management before taking this class. What, when and how to measure cost and schedule to calculate the project performance. You will learn to identify variances between the projects and manage the portfolio budget at ease and report project and portfolio performance with a smile and healthy attitude. You will know how to calculate the cost and schedule values, estimates at completion and performance indexes. Here are the topics at a glance.